Welcome back to Noble & Cooley with this updated Custom Design (CD) Maple kit incorporating a bunch of unique and intelligently judged features. It is a rare company indeed that can boast of making a campaign drum for Abraham Lincoln in 1860. 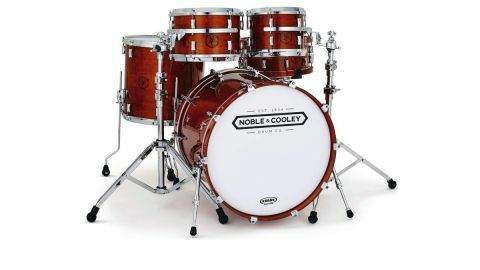 Noble & Cooley actually started making drums in 1854, and right up to 1980 it was best known for making toy drums. The first Custom Design (CD) Maple drum sets were seen in 1983. But it was the introduction in 1984 by Jay Jones (a direct descendant of James Cooley) of a professional snare drum with a solid maple shell that inspired the now-widespread custom drum industry. N&C revived the spirit of the 1920s with steam-bent single plank drums with vintage tube lugs. Since then dozens of small companies have tried hand-building custom-order drums, but N&C was the trailblazer and continues to maintain exemplary standards, as illustrated by the magnificent kit you see here, hand-crafted in Granville, Massachusetts, the historic base of this special company. While N&C’s modern reputation was made by re-introducing solid steam bent snares and kits (which are still available), the CD Maple series has been a mainstay since 1983, although its presence in the UK has been sporadic. Featuring recent modifications, the CDs are once more available over here via Drumazon, based in Cardiff. Our review kit sizes are 22"x18", 16"x15", 12"x8", 10"x7½", with a 14"x6½" snare featuring optional wood hoops. Shells are North American maple, standard cross ply, made to N&C’s specifications by Keller. That spec includes variable ply lay-up; so 8" to 13" drums are 7ply and 4.5mm thick; 14" to 18" shells are 8ply and 5.5mm thick; while 20" to 24" bass drums are 9ply and 6mm thick. Bearing edges are hand-cut and finished at 45 degrees on toms and snare, 30 degrees on the bass. Snare beds consist of a tapered 5½" dip reaching a maximum 1/8th" depth. All edges have a slight outside round-over to the outside. The finish is Honey Maple Gloss, superbly applied, rich and burnished. Of course, N&C is a custom company, and that includes finishes. So you can choose from innumerable hand-finished oils, stains or paints in gloss or matte, just a selection of which are up on the website. N&C is serious about resonance, so no wraps are offered and no heavy metal badges, just a stencilled logo. That’s the basics, but N&C has always gone its own way and done things differently. Differently for good reasons, based on long consideration followed by experimentation to determine the exact way any modification to drum design alters the sound. For example, N&C was the first company to discern the benefits of nodal point mounting. Its tube lugs raised eyebrows back in the 1980s because they had just single point fixing at the lower nodal area of the shell. The CD Maple has its own proprietary CD bridge lugs, which have two-point fixings. They are cast from zinc and use a delrin (thermoplastic) insert for silent operation. But the nodal principle is not forgotten. Which is where the concept of Symmetrical Venting comes in. While drums usually have single vent holes drilled into the shell (often centrally with a grommet for fixing the metal badge), N&C employs multiple holes. These holes are tiny - less than ¼" in diameter - and are concealed under the bridge lugs. They are drilled under every other lug on the lower side of the shell, again around the nodal circumference. So there are three holes in the six lug 10" drum, five holes in the 10 lug snare, and so on. The (optional) die-cast tom hoops are also atypical, being 1¼" high, which is taller than normal. Thus they protrude higher above the batter head than usual, rather like Gretsch, but more exaggerated. They also slope in towards the centre of the drum quite noticeably. Moving on to the snare, the N&C throw-off is another rare bit of kit. It employs a beefy chrome-plated brass pull-away bracket, which is quite stiff (in a good way). The brass tension knob itself is small but works easily and effectively. Each throw-off seems lovingly hand-made to suit the customer. There’s the inscrutable vibe of a workshop run by the sort of oil-rag character who restores steam engines and knocks up wondrous objects by hand with a lathe and file. Yes, we know, this is getting misty-eyed, but it’s a red letter day when something arrives that is so tactile and singular. The snare wires are also unlike other manufacturer’s. They can only be attached by traditional strings to the end plates, which have two small gaps in the 20 wires (grouped six-gap-eight-gap-six) especially for the attachment of the strings. This simple but effective design ensures the wires lay flat on the resonant head. Also smart is the Cool Mount quick-release small tom system. This is a modern version of those old clip-on style holders that were widespread up to the 1960s. The tom is supported by a RIMS style bracket, which has a cast hook (rather sturdier than the clip plates of old) that slots snuggly into the aluminium receiver block. The latter clamps to your stand via any ‘L’ style tom bracket. The great advantage is that once you have set your angles the toms literally slip into the aluminium receiver block with no drum key or wing nut tightening involved. This is not your everyday kit that comes straight out of the boxes sounding like most every other kit. No sir, here we have a Rolls Royce kit - and a vintage Roller at that. It looks and feels hand-crafted, it has idiosyncrasies and it takes some coaxing to get the best out of it. Which is our way of saying we have to work to get the sound we’re hoping for and indeed expecting. So while the 10"x7½" tom sings its little heart out straightaway, the 12"x8" pulls up short at first and feels a bit stunted and boxy. It comes detuned and putting tension on the top head the response is a little choked and uptight where we’re expecting it to resonate merrily. Those high-profile cast hoops are tight on the shell and - rather like Gretsch - they wrap around and focus the sound. So you have to experiment with the tuning, top and bottom, to get the drum to break free, which pretty soon it does. And as a bonus, with those high-profile hoops there are fantastic rim shots to be had off the small toms, if that is your thing. By contrast, both the 22"x18" kick and 16"x15" floor tom feel spacious and full throttled immediately. With the front head intact and a pillow inside the bass drum is deep and warm. The attack from the 30 degree edges is rounded, and the overwhelming feeling is of a rich dark thud that swells for a second or two and then closes shop tidily. The shell is thin and reverberant, the symmetrical venting allowing the drum to breath easily. These two big drums work convincingly at a variety of tunings from low to high. Finally, the snare. Expecting woody warmth from those (optional) stout wood hoops we’re taken aback by the sheer bravado of this drum. It’s sharp edged but with a wide open centre, and those cam action snare wires are cutting and metallic, almost abrasive to the ears. Add in the natural brightness of maple also and you could say the drum is too lively! It’s not easy to get a controlled sound and again some perseverance is necessary to get the balance right. Ironically, we find myself trying to soften the attack and quieten the tone. Grabbing a tiger by its tail springs to mind. Then again, this is a cool problem to encounter when so many drums are tame by comparison and just don’t cut the mustard. On the plus side, this snare definitely slices right through. Rim shots ricochet around the walls. Side sticks have a piercing wood block tone, which is what you’d expect as the wood hoops are ¾" across. The tensioning bolts are recessed and out of harm’s way. But you might have a problem getting a stand that is big enough. With the chunky wood hoops (an optional extra, remember) the drum is 15¾" across and many stand arms don’t extend that far. Drumazon sent us a Sonor 400 stand that opened up just enough. This is a big sounding kit and a unique instrument. It takes a bit of wheedling, a modicum of thought and experimentation. Our guess is if you have a kit like this for a few months you gradually get to know it and foster the best from it, a truly personalised sound. It has individual character, unlike the mass-produced sound most kits readily serve up.